It’s been awhile since I’ve written a post. Twittering and work has kept this blog at bay. But recent incidents have really compelled me to put down my thoughts on the keyboard. I was on Twitter at 5:40 when rampant news about Michael Jackson’s supposed death started circulating. It was a bit of a frenzy on twitter as the community continued to post news articles, which were conflicting. No one jnew what to believe. TMZ first came out with the story but most of us waited for CNN to come out with an official word. It took a while to get through all the postings to figure out what was true. I called my sister to check the news to verify the reports..it took some time ..anyway, when it was all said and done and all news sources confirmed the inevitable it came with an overwhelming shock to me. I didn’t know what to think. I spent the next few hours just glued to the TV and my laptop just watching all my favourite videos and pouring over the accolades and reminiscence. I finally broke down Friday night…don’t exactly know why but I guess the realization that MJ was gone really hit home. Let me step back…..I have always been a huge MJ fan. My reclusive childhood meant that going out with friends was a luxury, so I spent lots of time in front of the tube watching videos….specifically MJ, replaying the dance moves and mimicking the choreography, particularly the backslide aka moonwalk. My sister was a much better dancer than I so she was the standard I could only aspire to. I still remember the Victory Tour 1984, Detroit. My sister and I won tickets through the local radio station. When the day finally came we showed up — one glitter glove on each of our hands, black jeans, white T-shirts and the signature single glove earing —- with keen anticipation when Michael would descend from his helicopter. 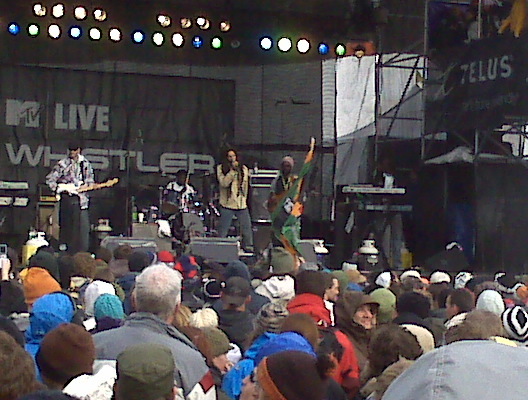 When he did come on stage, utter frenzy erupted. Our dance moves did not really play out since most of the fans, including my sister, were constantly screaming at his very presence. His style, his presence, his music was sheer genius. It was one of the most spectacular shows I’ve ever seen. Since then my love for this artist has not waned. The controversy that raged some years back did not change who he was to me. I agree he was a still a child at heart that, however naive, wanted to make people happy either through his music or his philanthropy. His influence touched millions: artists, generations, young, old. Even the famed viral Cebu Inmate videos, which drew millions of views for the Thriller rendition drew attention 2 days after Michael’s passing with another tribute video for Michael of “We are the World”. Ultimately, the man who lived, in my mind, equalled, if not surpassed, the influence of Elvis Presley. He died young and the pressures he must’ve lived with as a celebrity, as a man trying to shed the cloud of scandal and constant negativity, must have been overwhelming. Very few people could influence culture as he did; could corral millions into doing good and making a difference with his deeds. This video is what he has encompassed as a human being. “Heal the World” by Michael Jackson. 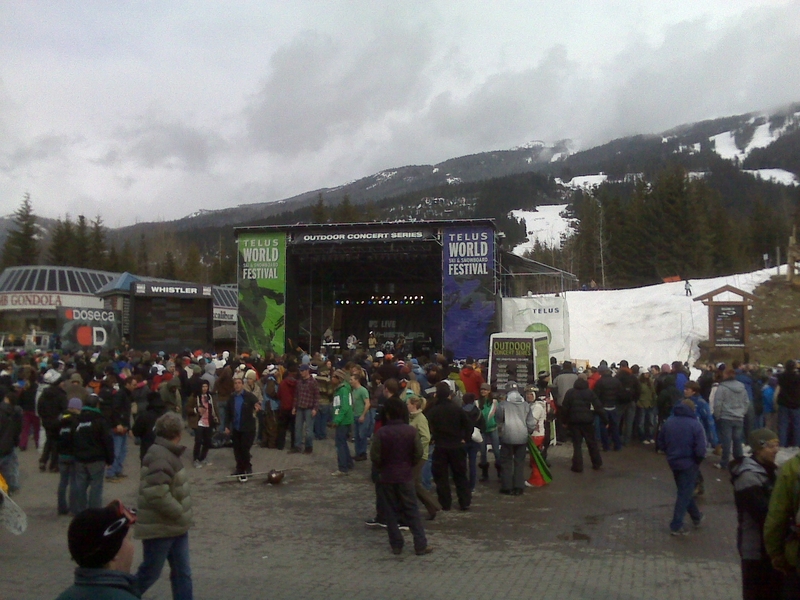 It’s my day 3 technically at TWSSF and I’ve been truly overwhelmed by the stuff that’s going on here. 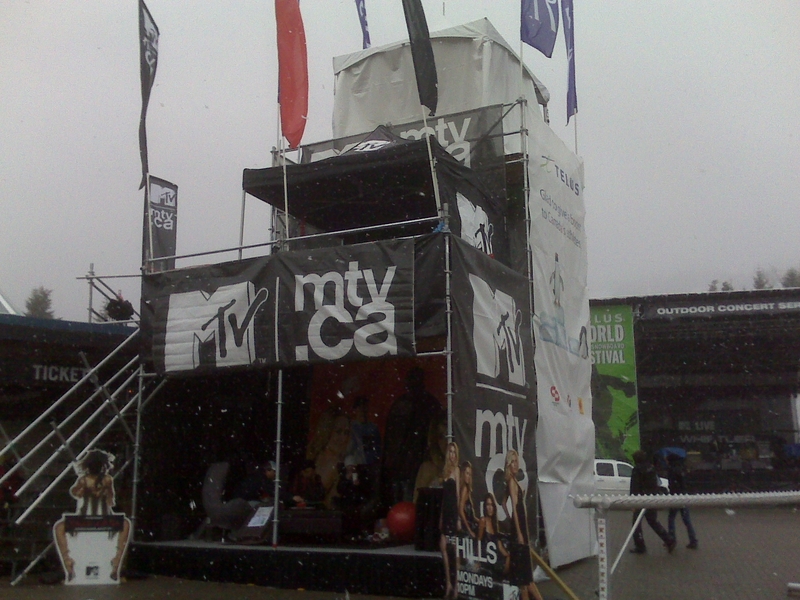 We’re here to showcase the Overlay.TV technology and build awareness for our brand. Filmmaker Showdown is where we will show our commercial but Fashion Exposed tonight is where we will really prove out this new video experience. We will be working with the event staff to film the entire show and overlay 19 brand segments consisting of clothing/skis/logos for each participating brand. This will be our proof of concept for clickable product placement. See our teaser video on the TWSSF site. It’s not all work and I’m definitely trying to do a bit of R&R and enjoy the stuff around me. I probably would have enjoyed it more if I was a skier. Go figure… I’m going to one of the most illustrious events of its kind and I don’t have the “Canadian” gumption to engage in its national sport. 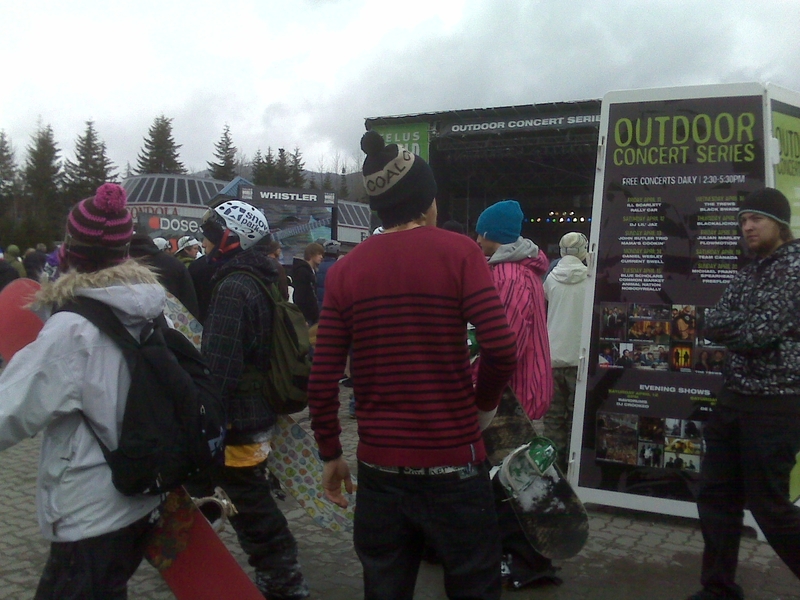 I do skate if that’s any consolation but it does not help me here in Whistler. 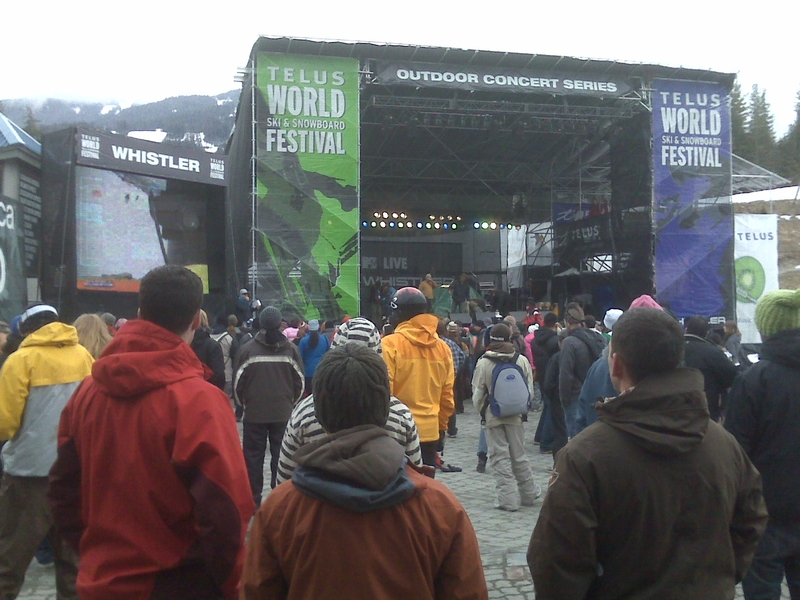 So I’ve chosen to après all day every day and take in the concert series, the food, the shopping and the amazing shows. 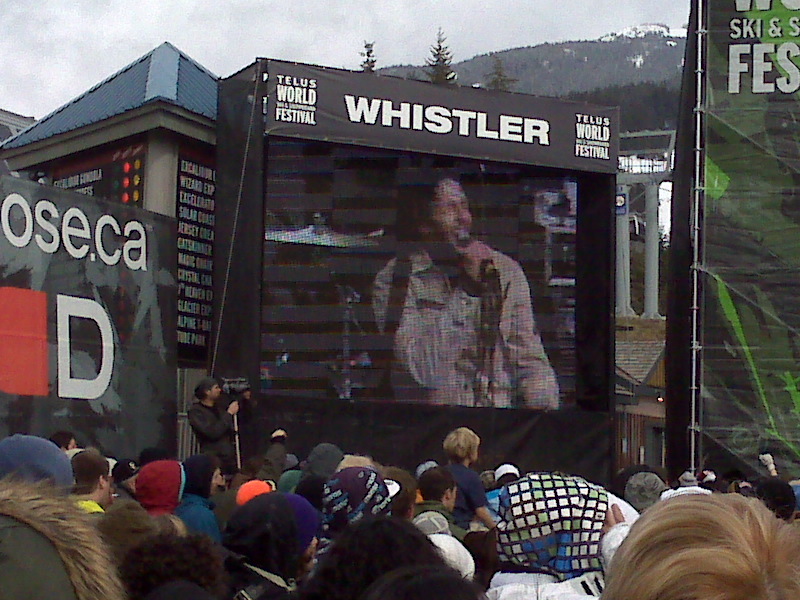 At 2:30 every afternoon, the skiers come of the slopes directly onto the main stage where they’re met with some of the coolest music from Julian Marley (pics below) The Trews, Ill Scarlet, Blackalicious, L’il Jazz among the many. This plaza is absolutely dead in the mornings as everyone typically takes to the slopes but by mid-afternoon when the sun’s shining and everybody’s ready for a brew and some downtime, this kind of entertainment is just the ticket. The Filmmaker Showdown was as awesome as I remembered it. The attendance was standing room only…at least 3,000 people here to watch the finalists who had been up for 72 hours creating a 4 minute film masterpiece. The submissions were awesome. The winner, ‘Arbitrarily Pear’ provided this quirky plot about the alternative to stairs….because “stairs are for jerks”….quite funny. The Pro Photographer’s Showdown totally blew me away as it showcased some of the best at their craft showcasing some of the best snowboarding, ski and landscape photos I’ve ever seen. The incredible shots were taken in places that required ability to get to some of the most remote and highest elevation points. So tonight, Fashion Exposed, tomorrow an Executive Breakfast and back to TO. Ok. so I’m all about music lately. This one is my favourite of all time: Pachelbel’s Canon. The video on its own is really compelling but what I did was create a story about the video itself. I wanted to provide some information about the artist behind the music, the number of viewers who were just as inspired as I was with this performance, and lengths the media took to find out who this guy was. Hypervideo can be really powerful if there is perceived value incremental to the content that already exists. I think I’ve done that in this example. Enjoy! I was fortunate enough to see this movie on my flight out to Vancouver today. It gave me a profound appreciation for the craft and true admiration for those that have the gift to really understand its magic. For someone who doesn’t have an innate ability nor a natural ear for music I have attempted to give it a try after failing miserably in my youth. Now I play the cello and I have a renewed strength and passion for an art that doesn’t come so easily to me. Initially it was a mid-life crisis approach to add some meaning and purpose in my life. And now it has given me a need to start feeling, not only hearing, the sounds as they interplay with the rhythms and strokes of the bow. I turn to it as a necessity and a retreat when nothing else provides this outlet for release. I’ve been taught to listen to the note and correct it as I play as opposed to playing the note and assume the position on the string has made it correct. The attached youtube video encapsulates this awe I’ve felt just watching it….now for probably the 20th time. For years I’ve never really understood nor really appreciated the composition of a rhapsody or sonata, the myriad and dance of each instrument as it weaves itself among the rest, faithfully fulling its role in the song. For the first time I’ve closed my eyes and opened my ears when I play and for me this has made all the difference. Who Says the Customer is ALWAYS Right?